Meet the next great gonzo engineering project: A 20-mile Red Sea-spanning bridge connecting Egypt and Saudi Arabia. The bridge has been spoken about for years and multiple attempts to begin work on it have fallen through; overcoming the odds now will be a feat of both political finesse and engineering. Post-revolution Egypt is reportedly about to embark on an audacious joint construction project with Saudi Arabia: A bridge over the Red Sea that would link the two country’s roads and railways. The bridge is slotted to take the form of a series of suspension spans and causeways on the lines of the San Francisco-Oakland Bay Bridge. Although the bridge is not expected to interfere with shipping, nearby Israel and Jordan are livid that construction could potentially hurt their geopolitical position–and the Egyptian public is worried the crossing is a sign of increased Saudi influence. The proposed 20-mile bridge would be built over the Red Sea at the Straits of Tiran, a series of narrow sea passages between Egypt and Saudi Arabia located near some of the world’s best scuba diving. However, the Straits of Tiran are also a highly strategic waterway–both Jordan’s lone seaport of Aqaba and Israel’s only Red Sea port, Eilat, send all their cargo through the straits. United Nations peacekeepers actively patrol the Straits of Tiran to guarantee freedom of navigation. According to Volkhard Windfuhr of German publication Der Spiegel, the Egyptian government formally approved construction of the bridge. The bridge will be a toll crossing; Egyptian authorities expect that payments from pilgrims traveling to Mecca will account for a large percentage of revenue. Der Spiegel claims that construction will be overseen by Egyptian general Abdul Aziz; however, a search of several Egyptian newspapers by Fast Company did not find any mention of Aziz heading the project in the local press. Meanwhile, Saudi Anglophone paper Arab News says merely that fresh studies have been launched on the project’s feasibility. 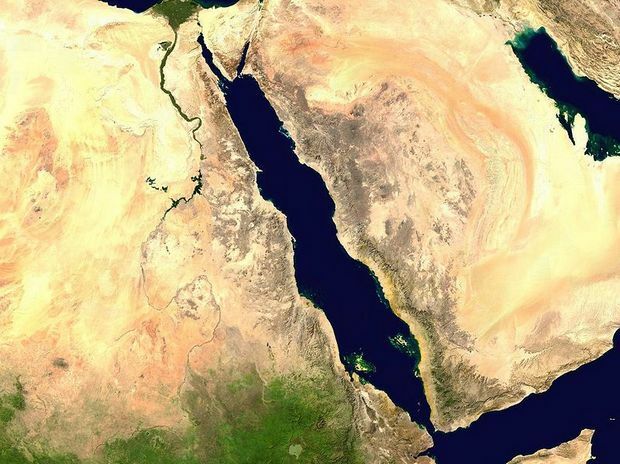 After all, the Red Sea is one of the world’s most seismically active zones, and any bridge built there would be at high risk of damage from a catastrophic earthquake. They don’t call it the Great Rift Valley for nothing. Discussions of the massive bridge project have been under way for a number of years. Egyptian-Saudi attempts to build the bridge were shelved for financial reasons in 2006. Then in 2008, the Saudi Arabian government began accepting bids for the rights to work on the Red Sea project, which is expected to cost an estimated $4 billion. It was delayed after Israel voiced objections to the project–which wasn’t the first time political tensions arose around the waterway. Egypt’s decision to close the Straits of Tiran to Israeli shipping was one of the primary causes of 1967’s Six-Day War. Gonzo engineering projects such as a bridge over the Red Sea–which, incidentally, would have helped Moses a lot back in the day–have a long history. The idea of a trans-Mediterranean bridge at Gibraltar or at some other nearby point has long been a theoretical exercise for engineers (even if geopolitical considerations mean the damn thing could never be built). That said, the scope of the bridge isn’t unprecedented: The People’s Republic of China has built some staggeringly long bridges including the 102-mile-long Danyang-Kunshan viaduct and the 70-mile-long Tianjin Grand Bridge. Here in the United States, the Lake Pontchartrain Causeway is a continuous bridge that is nearly 24 miles long. Despite Der Spiegel‘s piece on the project, much remains unsure. The Saudi Arabia-Egypt bridge has been spoken about for years and multiple attempts to begin work on the project have fallen through. Egypt is currently suffering through one of the worst economic downturns in years, and any attempt to build the bridge would come with a heavy Saudi price in terms of influence and economic concessions. Then there are the engineering and geopolitical concerns. However, if completed, it will be one of the most interesting public works projects of the decade.